Lenovo has really been in the labs, and their current breed of laptops and tablets is simply futuristic. They have crafted a technology niche of their own. 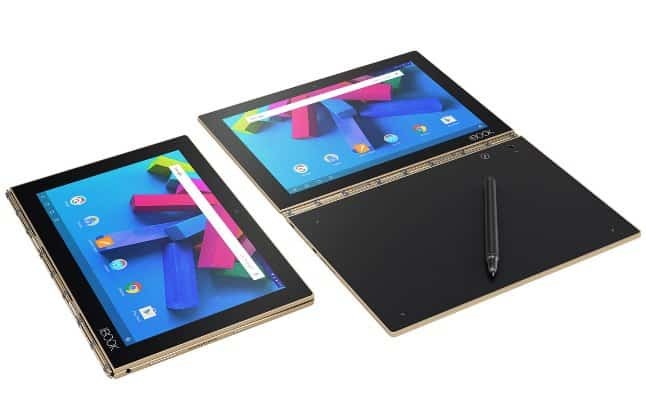 The Lenovo Yoga Book 2-in-1 is like none you’ve seen before. The tablet brings out the intuitive technology from Lenovo that will shift the Yoga design for the hybrid laptops and tablets. If you are a technophile, then the new Lenovo Yoga Pro will thrill you. Unlike the prior Yoga 2-in-1 models, the new tablet swaps the touchpad and keyboard for digital inputs. Yes, this laptop will be the first of its kind, a 100% digital touch keyboard. It might sound unbelievable and weird, but that’s how it is! Lenovo Yoga 3 Pro - 13.3-inch QHD Convertible Ultrabook PC - Intel Core M-5Y71, 8GB RAM, 256GB SSD, Windows 8.1. From the first sight, this model looks pretty similar to other Yoga laptops from Lenovo. Like most of its Yoga predecessors, the new Yoga Book is wrapped with a luxurious magnesium alloy shell. This model is insanely thin. It comes with a beautiful and impressive watchband hinge – that was first introduced in the Yoga 3. The fascinating Android version of the Yoga Book is expected to make super sales. It comes in a stylish finish: Gunmetal Gray, Champagne Gold and Carbon Black finishes. On the other hand, the Windows 10 version of the device has a Carbon Black finish. Al these finishes are premium. The speakers are sited just behind the dotted grilles, on the keyboard deck’s either side. The volume and the power button come on the right side of the device and edged in chrome. You will love the speakers’ volume and suitable range that they pump out. This is thanks to the Dolby Atmos technology! Yoga Book comes with a Full HD (1920 x 1200) 10.1-inch resolution screen. Its 400 brightness nits will leave you amused. The device can deliver over 16 million colors. This makes your entertainment experience a brilliant one. Screen sharing comes in a wide variety of angles thanks to the in-plane switching (IPS) feature. The device’s Halo, digital keyboard delivers a smoothing typing experience. It is a matter of time, and you will be happy to be typing on the digital, capacitive keyboard. There are audio cues and haptic feedback that will help you when typing, just similar to the tactile response when typing on a smartphone. You can optionally toggle them on or off. This feature does not, however, account to the typing accuracy. The backlit digital keyboard is kept behind a Gorilla Glass with individual keys lit. If you have loved typing on smartphones, then this digital keyboard will be awesome for you. Unlike the Windows 10 version that does not have the auto-correct feature; the Android version comes with the Lenovo’s TouchPal auto-correct that should help you learn the technique faster. On the other hand, the Windows 10 version has the right and left mouse buttons allowing the click-and-drag functions but lacks in the Android version. Nevertheless, the device works perfectly well. 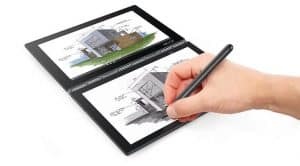 You cannot talk about the future in computing technology without mentioning the Lenovo Yoga Book’s Wacom digitizer feature. It is the first laptop to allow a full-blown Wacom digitizer on its keyboard. The keyboard can utterly transform to allow the use of a real Pen stylus. There is a capacitive button that has a pen icon above the keyboard. This button can be pressed and held to switch the keyboard from displaying keys and now illuminate the pen icon. If this is not futuristic and interesting, then what is? The Wacom Feel Technology powers the Wacom digitizer feature. Lenovo has branded it as the Create Pad. It is a layer of EMR (electromagnetic resonance) film below the keyboard. The Real Pen can easily operate without much of a hassle. This feature changes the whole game in modern computing. 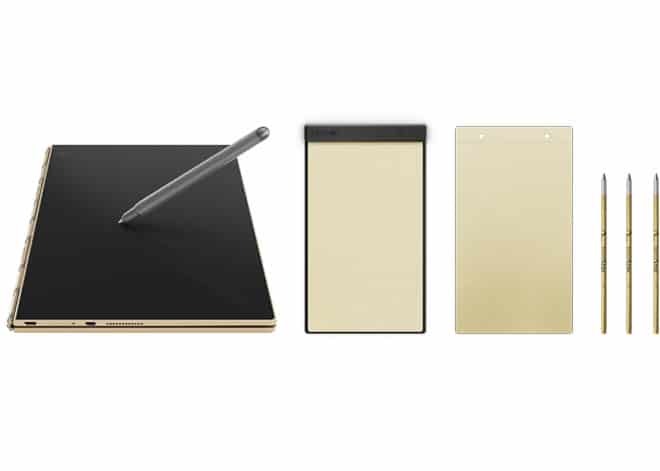 The Wacom digitizer feature works even in reverse table direction with a traditional notepad and a digital backup. This will go a long way to saving the battery life. It gives you the freedom to use ordinary ink on paper rather than a stylus on a glass screen but still having your work in digital format. The Halo Keyboard and Create Pad are two brilliant features of this Lenovo Yoga Book. The portability and ease of use that comes with this laptop is incredible. Using the Halo Keyboard is highly accurate and comfortable. With the Create Pad technology, anyone has a chance to express fun with the device. In the Windows 10 version, lack of auto-correct yet it is available for mobile OS leaves a lot of gaps. The Android version lacks the drag-and-drop mouse functionalities, which are very important. The Lenovo Yoga Book shapes a great future for its devices. The features are incredibly modern, but a few changes are required to put it in a bracket of its own. The competition might be way below this laptop, but adjustments are needed. If you love technology and the enthusiasm that comes with it, then get your Lenovo Yoga book now! It is the world’s thinnest and lightest 2-in-1.